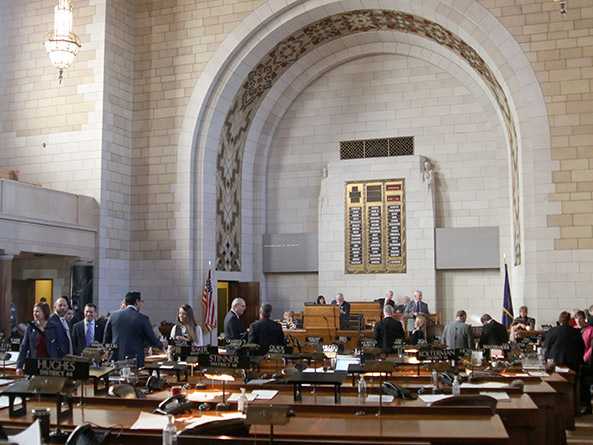 The 105th Nebraska Legislature convened Jan. 3 for its 60-day second session. Lawmakers welcomed Omaha Sen. Theresa Thibodeau, who was appointed to replace former Sen. Joni Craighead. Senators voted 25-24 to elect Omaha Sen. Robert Hilkemann over Hastings Sen. Steve Halloran to lead the Committee on Committees, a post left open by Craighead’s resignation in September. The committee appoints senators to the Legislature’s standing and select committees. In his speech announcing his nomination, Hilkemann said he has been a leader in his profession, community and church. He also has served as vice chairperson of the Appropriations Committee and was selected for a national leadership program for state government officials last year. As a current member of the Committee on Committees, Hilkemann said, he understands how the Legislature’s work depends on assembling good committees. “I have seen how important our work is and how the values of integrity, honesty, transparency and fairness are imperative,” he said. Lawmakers also elected Jim Doggett to serve as the Legislature’s chief sergeant-at-arms. The sergeants-at-arms maintain order in the legislative chamber, lobby and committee hearing rooms. He replaces Ron Witkowski, who retired last year after 21 years with the Legislature. Nebraska Supreme Court Chief Justice Mike Heavican swore in Doggett, who served as the Legislature’s assistant sergeant-at-arms from 2013 to 2017. Previously, Doggett was a member of the Nebraska State Patrol from 1988 to 2007, when he retired from the position of Captain of Carrier Enforcement. Senators may introduce bills for the first 10 legislative days, or through Jan. 18. Gov. Pete Ricketts will give his State of the State address Jan. 10 in the legislative chamber. Heavican will give his State of the Judiciary address Jan. 18. Committee hearings begin Jan. 16 and full-day floor debate starts Feb. 28. The session will last 60 legislative days and tentatively is scheduled to end April 18.